It’s that time of year again and I have the perfect recipe for a quick and tasty treat to get you feeling festive. As an added bonus your kitchen will be filled with the delicious sweet buttery smell of baking along with freshly zested orange – and nothing quite says Christmas like chocolate orange. 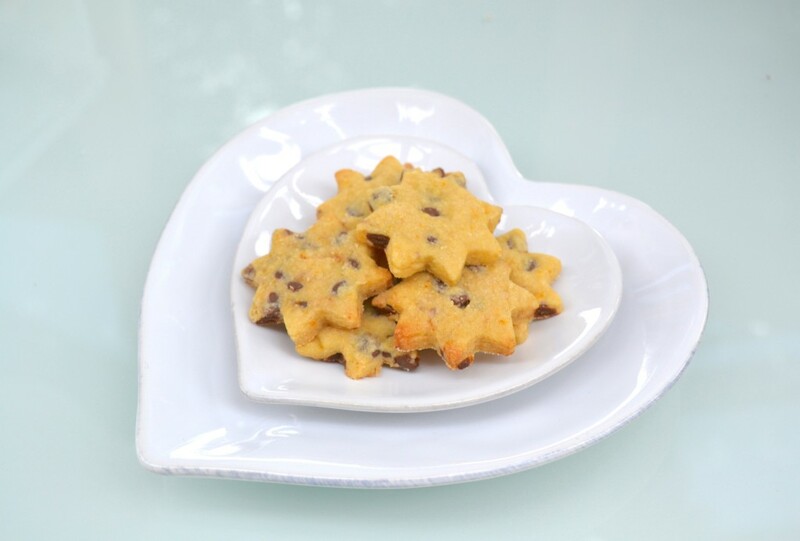 These little shortbread biscuits will keep for 3 or 4 days in an airtight container, if they last that long! The London food scene is constantly shifting and expanding to fresh neighbourhoods. 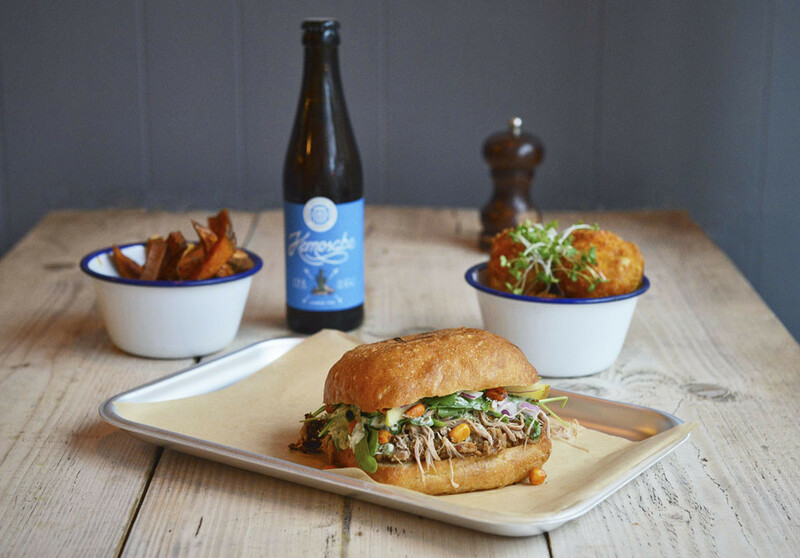 Recently, Balham has benefited from this boom with the revamp of Hildreth St Market, becoming a food & drink destination with the likes of Milk and Brickwood – and also with new outposts of the chains Bodeans and Franco Manca. One of the latest to enter the area is Brother Marcus, opened six months ago by three talented school pals. They initially focused on serving up a cracking brunch with all the usual suspects putting on a great show – plus a few witty additions such as the “Sugar Daddy” – aka; cinnamon French toast, berries, maple syrup & mascarpone. Since their brunch has been going down such a storm, the lads have decided to open in the evenings, so since I live in the area I thought I’d better go and check it out. The restaurant itself is pretty cool and casual which is also reflected in the menu. I think it’s safe to say that this is based on the “manwhich” idea. Big stuffed sandwiches full to the brim with flavour. The boys have let their personality shine through, naming them imaginatively; Shroom of Doom”, “The Pollocks”, “Notorious P.I.G” and “The Salty Wench”. These definitely put a smile on my face, though I’m not quite sure about the last one… it doesn’t quite conjure the best of images! I went for the Shroom of Doom and the Notorious P.I.G. 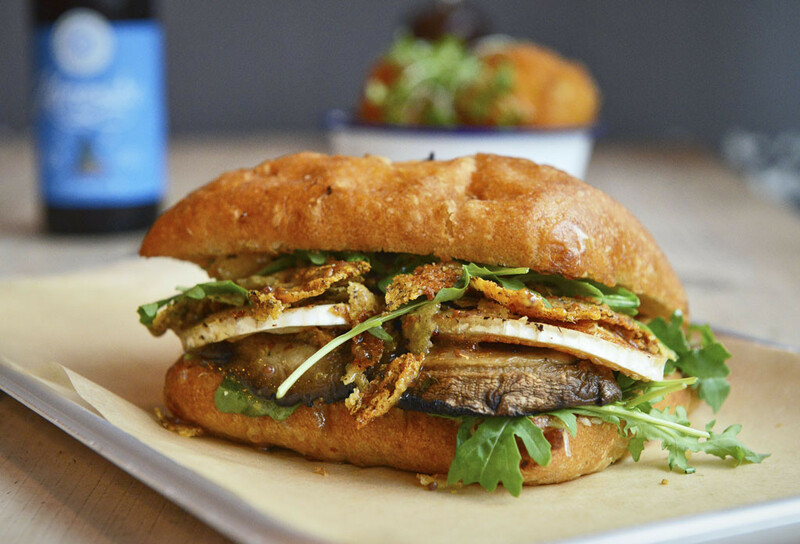 The former was a beautiful combination of mushroom, goat’s cheese and rocket with a honey mustard dressing. Having made countless vegetarian sandwiches in my time, for both my Eat Vegetarian cookbook and my veggie sisters, I can tell you that this was a cracker. Even a committed carnivore like me was really content with this. Moreover, the Notorious P.I.G. wasn’t just another pulled-pork sandwich. It was a well thought-out combination of tender pork, crunchy apple, lime yoghurt with a fresh zesty sauce. I obviously had to try some sides too so ordered some Mac & Cheese balls – delicious – and some Sweet Potato Fries with Aioli, which were some of the best I have ever eaten. The dessert was Divine Chocolate Mousse Cake which was created in collaboration with Divine Chocolate for chocolate week…and let me tell you, it sure was (divine). Super-rich and packed with pure chocolatey goodness, it’s the kind of pudding I certainly go for. The food was great and it’s somewhere I’d recommend if you want a very reasonable (£8-£9 per sandwich) hearty meal with your mates. For couples, it might be a good idea to wait until you are really comfortable each other before smearing your face with the contents of these tasty sandwiches. This is delicious food that doesn’t take itself too seriously and if you are a fan of a proper sandwich you should certainly check this one out. Blood oranges are in season at the moment so make the most of them whilst they are around as they are so vibrant and will brighten up any dish. 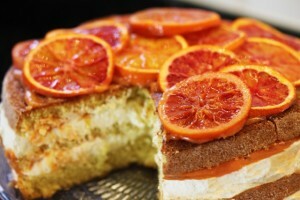 This cake using a light whisked sponge that is perfect layered up with cream and colourful blood orange. It is best to make the cake the day before you are going to serve it as it is too fragile to cut up straight after baking. 1. Get practicing before you leave home. Having the basic techniques under your belt will help massively in terms of confidence and knowing what equipment to take. 2. Find someone to cook with you; it can be really useful to have someone to ask/blame. If you don’t, then follow the recipe very carefully. You can always tweet me if you have any queries. 3. Things will go wrong, don’t stress about it. I still make mistakes all the time and they are great because you learn from them. The mark of a good cook is knowing how to avoid and rectify these mistakes. This will come in time. 4. Make sure you read the recipe through. Sometimes things need to be pre-heated, pre-chopped or cooked for a long time. You don’t want to find yourself half way through a recipe and find you don’t have the time to do it. 5. Eat vegetarian! It can be a really good way to save those pennies. 6. Get your flatmates to contribute towards store cupboard essentials such as herbs and spices. They tend to last for a long time and make such a difference to a dish. Well worth it! 7. Shopping is key. Go to butchers and fishmongers if you can. They often have superior knowledge, which can include great advice on what to do with cheap cuts of meat or fish. It can be worth saving your money for good quality meat rather than buying as cheap as possible from the supermarket. The taste is often infinitely better. 8. Shop smart- make a plan before you head to the supermarket with what you want to eat over the next couple of days. Don’t go when you are hungry or you will impulse buy anything and everything. Find out when the reduced section will be fully stocked and raid it for last minute bargains. Often supermarket own-brands can be better and cheaper; don’t get fooled by fancy packaging. Keep an eye on that sell-by date. There is nothing worse than buying food that sneakily goes off very quickly. 9. Plan to cook dishes that can last for more than one meal. A stew, a tart or a curry can last for a few days. A whole chicken can be more expensive than a pack of breasts but you can fillet it, then it can last for at least 2-3 meals. The freezer is also a really good tool to use for stretching ingredients to multiple meals. 10. Finally, cooking with your friends and flatmates is a great way to reduce costs. It is a great social event, splits the bill and brings everyone together. Every Tuesday night, in first year, we had a dinner party for 10-15 people. It allowed us to have massive homely roasts for just a few quid but also meant that we met new people and had a great time.